Livingston cruised to a comfortable 2-0 win in front of the lowest Ladbrokes Premiership crowd of the season to increase Hamilton’s relegation fears. Just 1,022 were inside the Tony Macaroni Arena to see second-half goals from Ryan Hardie and captain Craig Halkett seal a win for Gary Holt’s side. Hamilton remain locked in a relegation battle and they were second best against Livingston, who should have won by a far greater margin. Hamilton are only four points ahead of second-bottom St Mirren and face the Buddies in a massive league clash on Saturday. Livingston scored within the first minute of the second half as Hardie, who is on loan from Rangers, grabbed his seventh goal of the campaign. 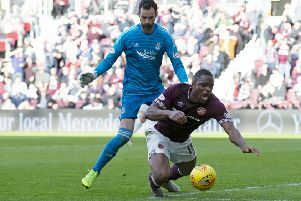 And they wrapped up the points with 11 minutes remaining when Halkett, who this week signed a pre-contract deal with Hearts, headed home. Livingston went close to opening the scoring inside the first minute as Alan Lithgow’s long throw was flicked on and Hardie looped a header just over the crossbar. The West Lothian side dominated the first half with their direct style of play forcing Hamilton on the backfoot. Hardie tested Gary Woods with a drive from 25 yards before Accies were forced into a change when Aaron McGowan was unable to shake off the effects of a crunching challenge from Rickie Lamie and was replaced by Alex Gogic after 19 minutes. Livingston had the ball in the net but their celebrations were cut short when Declan Gallagher was penalised for a foul on George Oakley as he headed in Keaghan Jacobs’ corner. Scott Robinson then went close for the home side when a free-kick broke to him inside the penalty area but his crisp drive was deflected just wide. Three minutes before the break, Hardie spurned an opportunity when he sent a free header from a Jacobs free-kick straight at Woods. Gary Holt made a change at the interval as Dolly Menga, back after a two-month injury lay-off, came on for Lamie. Within a minute of the second half Livi went ahead through Hardie. Hamilton were slack at the back as the striker raced onto a ball over the defence from Scott Robinson and produced a clinical finish with a drilled a shot into the bottom corner. The home side should have doubled their lead soon after when they counter-attacked from a Hamilton corner and Robinson delivered a cross that Scott Pittman should have finished off, but sent his header wide from three yards. Gogic prevented Craig Sibbald from grabbing a second when he brilliantly blocked his drive on the goal-line. Livingston, however, notched the second goal their dominant display deserved when Sibbald swung in a cross and Halkett powered home a header. Raffaele De Vita came on for his first appearance of the campaign after a lengthy injury lay-off for Hardie with nine minutes remaining. Hamilton almost pulled one back but substitute Mickel Miller was denied by goalkeeper Liam Kelly.